Though many of the more obvious tasks of logistics management (such as directing shipments, planning routes, and making sure your products get where they need to be in a timely fashion) may seem like solitary, in-office work, many aspects also require excellent people skills and the ability to negotiate well. Whether it’s managing employees, building a great team, negotiating with warehouses and shipping companies, or keeping in contact with clients—and often all of the above—being able to comfortably work, negotiate, and communicate with others is necessary to achieve success in logistics management. Logistics management requires the coordination of a lot of moving parts: negotiating costs, managing a team, determining routes, processing shipments, etc., and making sure all of it is done well. All of these moving parts are like constantly changing puzzle pieces that must be put together perfectly with each new order, shipment, or client. In order to fit all these pieces together in a way that will please clients and customers, warehouses must be open to, and good at, thinking outside the box and creating innovative solutions. The ability to creatively discover new solutions is a great advantage in negotiating with clients and customers, optimizing shipping costs and delivery time, and even planning new routes for delivery. 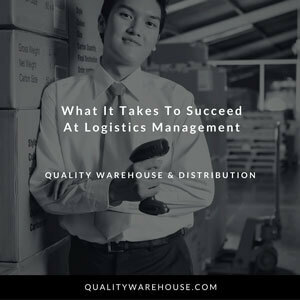 Each warehouse has different strengths and capabilities—some have their own fleet of vehicles, or systems of organization, and others partner with nearby companies to achieve their goals. No matter the organization of services at any given warehouse, all need to have and maintain friendly connections with clients, customers, and partner businesses to make sure all their systems and shipments, both internal and outsourced, run as smoothly as possible. The ability to keep track of many orders, shipments, and products, both moving and stable, is really at the heart of logistics management. Therefore, it’s absolutely necessary to have a system of organization that not only keeps each shipment in its designated place, but is also easily understandable by team members and clients. This is also why a clean warehouse isn’t just for looks; it’s very important to make sure the entire business runs smoothly. In order to succeed in logistics management, a good system of organization—and the ability to keep track of it all with a clear head even through fast-paced and stressful times—is necessary. Throughout all of these skills and systems, any good warehouse must be committed to providing quality service. It’s this drive that will motivate teams to meet their goals, make sure shipments are on time, keep costs as low as possible, and ultimately make sure customers are pleased with their service.